The Range Rover Sport SVR has set a new SUV lap record at Nürburgring. The 5.0-litre supercharged V8 lapped the Nordschleife circuit in 8 minutes 14 seconds. The time was carried out by a Land Rover driver testing a standard production example. The Range Rover Sport SVR will go on sale in 2015 and will be the fastest and most powerful Range Rover ever built. The SVR has been produced by Jaguar Land Rover’s Special Vehicle Operations team and is powered by an uprated version of Land Rover’s 5.0-litre supercharged V8 engine, which has been tuned to deliver 550PS – a 40PS increase over the existing V8 Supercharged derivative. The fire breathing SUV will go on sale in 2015 and will be built alongside the standard car at the Solihull plant in Birmingham. Prices are expected to start at £100,000. 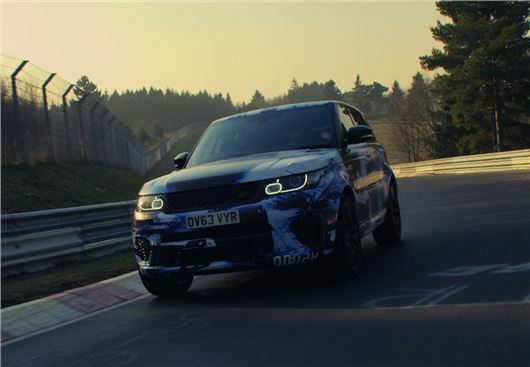 You can see the Range Rover Sport SVR in action at Nürburgring by clicking the video below.